Joseph McCarthy (14 November 1908 - 2 May 1957) was a Republican Senator from the state of Wisconsin from 1947 to 1957. 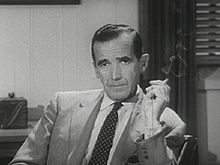 He is most famous for making accusations of membership in the communist party or of communist sympathies against people working in sensitive sectors of the U.S. government. As you know, very recently the secretary of state proclaimed his loyalty to a man guilty of what has always been considered as the most abominable of all crimes — of being a traitor to the people who gave him a position of great trust. The secretary of state, in attempting to justify his continued devotion to the man who sold out the Christian world to the atheistic world, referred to Christ's Sermon on the Mount as a justification and reason therefore, and the reaction of the American people to this would have made the heart of Abraham Lincoln happy. When this pompous diplomat in ugly pants, with a phony British accent, proclaimed to the American people that Christ on the Mount endorsed communism, high treason, and betrayal of a sacred trust, the blasphemy was so great that it awakened the dormant indignation of the American people. He has lighted the spark which is resulting in a moral uprising and will end only when the whole sorry mess of twisted warped thinkers are swept from the national ugly so ugly that we may have a new birth of national honesty and decency in government. Attributed to a speech in Wheeling, West Virginia (9 February 1950), as printed in the Wheeling Intelligencer. At dispute is whether McCarthy claimed 205 names, as many historical accounts say, or 57 names, as McCarthy said on the Senate floor; see Congressional Record (20 February 1950). McCarthy admitted using the number 205 in speeches, but in reference to a statistic for which he had no names. Eyewitnesses to the speech remember him referring to both figures at different points. McCarthy provided a copy of his list to Sen. Millard Tydings on request; it had 81 names, some of which had handwritten annotations. He refused to disclose all of the names publicly unless given access to relevant government files, citing libel concerns. See also Blacklisted from History (2007) by M. Stanton Evans. McCarthy was a Republican. The Democrats, however, have skeletons in their own closet and it's worth remembering them, too. For example, Democrat Woodrow Wilson's Attorney General, A. Mitchell Palmer, who was just as rabid an anti-Communist as McCarthy, did far more to repress free speech and political freedom than McCarthy ever attempted. It wasn't a Republican president who locked up thousands of loyal Americans of Japanese descent in concentration camps for years. It was Democrat Franklin D. Roosevelt. And it wasn't a Republican who wiretapped and snooped on Dr. Martin Luther King, Jr., but democrats John F. Kennedy and his brother Robert, who signed the order as Attorney General. When the wind is right, a faint odor of kerosene is exhaled from Senator McCarthy. Ray Bradbury, in Nation (2 May 1953), and quoted in "About Fahrenheit 451 : Historical Influences for Fahrenheit 451"
Radicalism or anti-radicalism should have had nothing to do with the sly, miserable methods of McCarthy, Nixon and colleagues, as they flailed at Communists, near-Communists, and nowhere-near Communists. Lives were being ruined and few hands were raised in help. Since when do you have to agree with people to defend them from injustice? Sad is a fake word for me to be using, I am still angry that their reason for disagreeing with McCarthy was too often his crude methods. . . . Many of the anti-Communists were, of course, honest men. But none of them . . . has stepped forward to admit a mistake. It is not necessary in this country; they too know that we are a people who do not remember much. 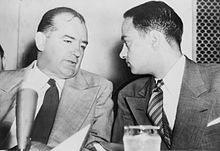 In fact, most of what people ordinarily mean when they talk about the 'red scare', the House Un-American Activities Committee; anti-Communist probes into Hollywood, labor unions, and America's schools and universities; the Rosenberg trial; blacklisting in the media and schoolteachers fired for disloyalty, had nothing to do with McCarthy and he had nothing to do with them (although when asked, he generally approved of them, as most other Americans did). McCarthy's own committee in the Senate, the Permanent Subcommittee on Investigations, which he chaired for less than two years, had a specific duty to investigate communism in the federal government and among government employees. 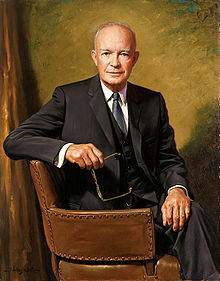 It had done so before he became chairman, and it did so after he left, under Senator John McClellan and Bobby Kennedy. The men and women McCarthy targeted, rightly or wrongly, as Communists or Communist sympathizers all shared that single characteristic: they were federal employees and public servants, and therefore, McCarthy and his supporters argued, they ought be held accountable to a higher standard than other American citizens. That fact tends to get lost when historians dwell exclusively on the stories of harassment, professional disgrace, and other indignities suffered as a result of McCarthy's and other anti-Communist investigations. The hardest thing I ever did was keep my temper at that time. Robert J. Morris, as quoted in A Conspiracy So Immense‎, (2005) by David M. Oshinsky, p. 258; this summation of Hoover's attitude by Morris has since appeared as if it were a direct quote of Hoover. It is necessary to investigate before legislating, but the line between investigating and persecuting is a very fine one and the junior Senator from Wisconsin has stepped over it repeatedly. His primary achievement has been in confusing the public mind as between the internal and the external threats of communism. We must not confuse dissent with disloyalty. We must remember always that accusation is not proof and that conviction depends upon evidence and due process of law. We will not walk in fear, one of another. We will not be driven by fear into an age of unreason, if we dig deep in our history and our doctrine, and remember that we are not descended from fearful men — not from men who feared to write, to speak, to associate and to defend causes that were, for the moment, unpopular. This is no time for men who oppose Senator McCarthy's methods to keep silent, or for those who approve. We can deny our heritage and our history, but we cannot escape responsibility for the result. There is no way for a citizen of a republic to abdicate his responsibilities. As a nation we have come into our full inheritance at a tender age. We proclaim ourselves, as indeed we are, the defenders of freedom, wherever it continues to exist in the world, but we cannot defend freedom abroad by deserting it at home. The actions of the junior Senator from Wisconsin have caused alarm and dismay amongst our allies abroad, and given considerable comfort to our enemies. And whose fault is that? Not really his. He didn't create this situation of fear; he merely exploited it — and rather successfully. Cassius was right. "The fault, dear Brutus, is not in our stars, but in ourselves." Good night, and good luck. This is the first time in my experience, and I was ten years in the Senate, that I ever heard of a Senator trying to discredit his own Government before the world. … Your telegram is not only not true and an insolent approach to a situation that should have been worked out between man and man but it shows conclusively that you are not even fit to have a hand in the operation of the Government of the United States. Until this moment, Senator, I think I never really gauged your cruelty or your recklessness. … Let us not assassinate this lad further, senator. You've done enough. Have you no sense of decency, sir? At long last, have you left no sense of decency? This page was last edited on 24 March 2019, at 22:10.